I hate letting go of somethings. I am far from being a hoarder, but in a cultural way, I guess I am guilty of hoarding bygone things. 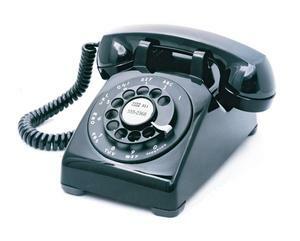 The thing I am having the hardest time with is letting go of our land line telephone. We each have a cell phone, but pay $60 per month on a land line that is barely used. My reasoning for keeping the line are good. I want to have a telephone line available in an emergency. Often when the power goes out the phone line will still work since it does not get its power from the house. The phone company also has the lines wired in a way that if a line to the north of you is down, the line to the south of you will still carry your calls. The damaged area is just circumvented; not true with the electric company. Another reason to keep the land line was a fool proof way to contact 911 especially with enhanced 911 we have here in Sturbridge. Enhanced 911 gives the callers address to the dispatcher if they cannot answer on the phone. This is a very important lifesaver. Cell phones can call 911, too, but most often the calls are going to a State Police barracks, and being rerouted to the police in your location. All this does is eat up critical time, and I prefer not to use that system unless I have to. Until recently, Reverse 911 calls were not available for cell phones. Reverse 911 calls are very useful in an emergency, and being without that information would not be our best interest. Now, the Reverse 911 calls are available for cell phones, and that has eliminated a big concern. So, what to do? Do I continue to have redundant services because I can't give up the house phone, or do I step up, and just rely totally on cell service? Well, this most recent storm, and the hurricane before it, knocked out cell service in our area for a few days, so that rules out going completely without a land line. So, it looks like I would need to keep a lesser version of Verizon. There are a couple of less expensive plans available, one for a little under $20 per month, and one for around $12.00 each month. Each has a different cost per call, and free calling area, but that area is not listed online, and the site advises you to call and talk to a representative to determine the exact area for free calling. A pay per minute plan would be ideal since we hardly use the phone, and it would still link us to emergency services if ever needed, or when the cell service goes out. Always good to have a an option, a Plan B.
I plan on calling Verizon, and getting more information in the next few days, and when I do, I will be sure to share the information with you. Letting go is never easy, but changing it up a bit is something I can handle. Now, next thing to consider is to let go of trash pick-up at the house. Is it really worth $100 every 3 months? Would I really save a lot by using the recycling center? Something else to think on. Any input from those of you who have taken the plunge to abandon the trash man, and are only using the Recycling Center would be appreciated. Let me know how you are doing. We stopped using a trash hauler years ago and haven't looked back. The recycling center in Sturbridge is well managed, very friendly folks work there, and there's also a recycle/reuse shed, where you can drop stuff you don't want and maybe find things you can use. We recently received a brochure in the mail from the Board of Health and it explains everything. I bought 5 rubbermaid containers that I keep in the basement. Each lid is labled: #1 plastic, #2 plastic, #3-7 plastic, paper, and tin cans. I also keep a sixth container for returnable bottles. I keep two large paper bags in my kitchen. One is dedicated to paper; the other is for all the plastic, styrofoam, and newspaper. Rinse out cans and styrofoam before putting into the bags. When they're full, which is about weekly, I bring both paper bags to the basement and dump the paper into the paper container; and I separate the plastics from the glass, newspapers, etc. I put all non-numbered plastics into a big plastic bag; all the newspapers go into a bag, and same for styrofoam. Each type of throwaway has its own place at the recycling center. This works well for us and we only bring a container to the recycling center about once every two weeks. As for household trash, buy the green Sturbridge bags you need at Micknucks or Stop and Shop. I buy the garbage container size and bring a bag a week to the recycling center. All this separating of trash has drastically reduced what goes into the landfill and most of it is recycled. You will drastically cut back on that $100 you spend every three months and it just takes a weekly trip to the recycling center and bit of adjustment in your Saturday morning schedule. But this isn't just about your time and money; it's about responsibly dealing with your own trash and reconstituting our garbage! Good luck. Thank you so much for your advice!! I went to Home Depot today and bought 3 large (33 gal) recycle containers. May be a bit of overkill since I will need about 3 more. I have then in the garage, but maybe the basement would be better--more room. Thanks again, and I will let everyone know how we do with the transistion. How many folks have all the space it takes to keep everything separated? It's more practical for us to pay the $33 per month and have our trash incinerated. I figure that money-wise the costs are not far apart, considering gas and wear and tear on the car to go the the recycling center each week, cost of bags for the recycling center, etc. Green is good. Burning the gas to drive down Breakneck Rd. - not so good. The question is would you recycle more if you were charged by thr pound or gal.? Eventionally that is what all haulers will charge in the future. If you recycle and compost you could save half of what your costs are today. I have recycled for years..but I agree going to the recycle center is a pain out of the way and time consuming. I also do not have room for all those bins, paper, cans, plastic, glass,colored glass, etc. I recycle all in one bin and the trash company picks it up along with my trash. I have put and take items sitting here for several weeks because I can not get to the recycle center when it is open. I guess what it boils down to whether you really want to recycle or not. I really want to; at first, it was a pain to get into the new routine but it's that way with most anything. But now I feel good about putting just one little bag of garbage in the landfill; whereas, I used to put out about 4, sometimes 5 bags at once for the trash truck to pick up. I don't mind driving to the recycling center, nor do I mind buying the bags. For me, it's about being responsible for my own garbage and caring about the environment; that takes anywhere from a few minutes to an hour on a Saturday. I don't mind and I save money to boot.